An air source heat pump is a microprocessor – controlled heating unit which transfers heat from outside (ambient) air to water. 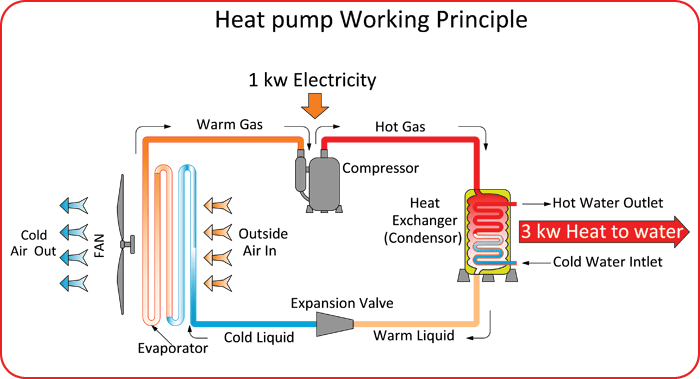 Under the principles of vapor compression refrigeration, it provides hot water without additional energy, COOLHEAT uses a refrigerant system involving a compressor and a condenser to absorb heat at one place and release it at another, sometimes called “reverse-cycle air conditioners”. In domestic/commercial heating use, COOL HEAT absorbs heat from outside air and releases it inside the building, as domestic hot water supply up to 60°C. Even at -20˚C heat pump can supply heating and hot water properties. A heat pump’s refrigeration system consists of a compressor, brazed plate heat exchanger and the coil made of copper tubing, which is surrounded by aluminum fins to aid heat transfer. In heating mode, liquid refrigerant in the evaporator coil extracts heat from the air and evaporates into a gas. The brazed plate heat exchanger release heat from the refrigerant as it condenses back into a liquid. Heat pump perfectly suited for industries like Hospital, Healthcare, and processing for both air conditioning and hot water required. • Thermostatic expansion valves for more precise control of the refrigerant flow to the evaporator. • Copper tubing with hydrophilic corrosion proof coating, grooved inside to increase surface area. • Plug and play design for ease of installation and commissioning. Dimensions & Weight High Pressure Natural Gas Hazardous Area Config.